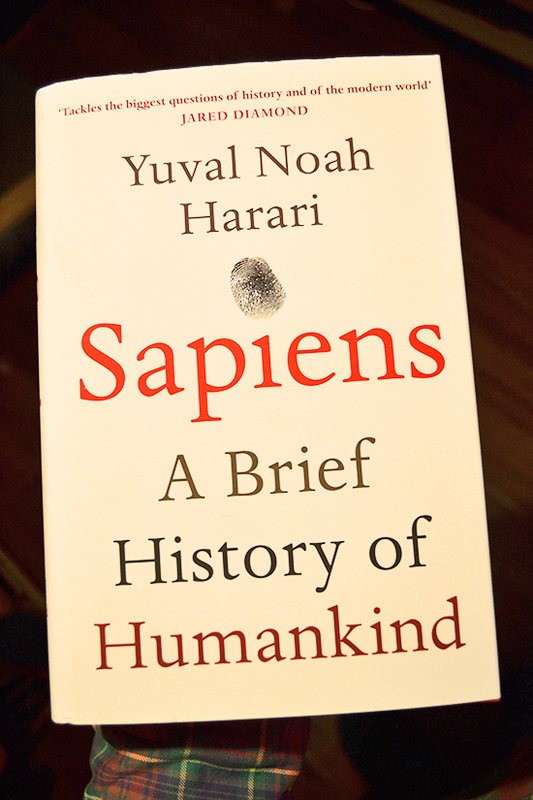 Sapiens: A Brief History of Humankind by Yuval Noah Harari provides deep context for understanding our connection to nature. It tells the story of our journey from a deep embeddedness in the reality of nature to a possible future as a new, engineered human species. I was keen to read the first two parts of the book, the cognitive and agricultural revolutions – the journey from an animal of no significance to the ‘fraud’ of an agricultural lifestyle. For two million years humans were marginal and weak creatures, living in constant fear of predators, where strong social ties were important to raise underdeveloped infants. Then came a cognitive revolution that saw a spectacular leap 100,000 years ago to the top of the food chain, outpacing the checks and balances of the ecosystem. Harari compares majestic predators such as lions, with a self-confidence derived from millions of years of dominion and evolution, to sapiens, underdogs full of anxiety and fear over maintaining our position – a situation at the root of many ecological catastrophes and historical calamities. Sapiens soon arrives at the history of language, the theories of its evolution and the development of the written word. This is important as the documents produced and accepted as binding allowed the creation of ‘imagined realities’ that have become more meaningful than the reality of nature – the imagined realities of our favourite brands, now mean more than the oak and owl. Harari details how these imagined realities allowed large numbers of strangers to cooperate and do business, in a cultural evolution that outpaced the genome, leaving us living in a dual-reality. And the diversity of imagined realities and resulting behaviours created cultures; the continual change in these is what we call history. Harari identifies the Cognitive Revolution as the point where humans declared independence from biology – we have journeyed from evolution and biology to cognition and history. Moving into the agricultural revolution, Harari provides a fresh perspective, wheat manipulating and domesticating Homo sapiens to its advantage, and firm opinions, with farming bringing about a miserable existence – for humans and animals. Through civilisations, economies and onward to the scientific revolution, industry and capitalism, Sapiens is an engaging and enjoyable read – rarely, if ever, getting bogged down, despite the constant opportunities provided by our history. Sapiens reminds us of the importance of history, not to predict the future, “but to widen our horizons, to understand that our present situation is neither natural or inevitable … we have many more possibilities before us than we can imagine”. Throughout the book, human wellbeing and the state of nature is a theme, asking questions about where we are heading, for ecological disaster or technological paradise? Sapiens confirms that nature connection isn’t about returning to a former way of life – it reminds us that humans have never lived in harmony with nature; our arrival in new lands has always had a huge impact on the ecosystem. The understanding of our connection to nature benefits from recognising our history and imagined realties, and involves accepting the reality of our shared place in nature, which impacts on our being here and now.